The Russian National Orchestra hit the Bay Area last Friday while touring the West Coast, and gave us a taste of how Russians do Russian masterpieces. Muscle and musicianship their watchwords, they played a chilling and incisive version of Dmitri Shostakovich’s Symphony No. 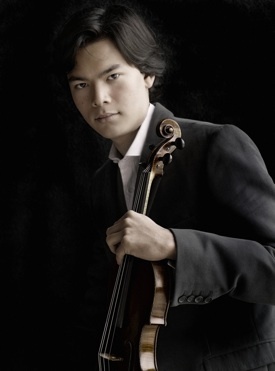 9 and accompanied Stefan Jackiw for a dynamic rendition of Tchaikovsky’s Violin Concerto. Mikhail Pletnev founded the Russian National Orchestra and conducted for its first ten years, and he was on the podium at UC Berkeley’s Zellerbach Hall Feb 19, and leading their tour commemorating their 20th anniversary. A composer and noted pianist as well as conductor, he opened the program with his own work, three songs for soprano and orchestra, set to the poems of William Butler Yeats. Lisa Delan sang the elegant but difficult soprano line, backed by vocalizations from Volti, Robert Geary’s excellent contemporary chorus. Yeats’ brand of Romantic symbolism was a good fit for Pletnev, who chose an old-fashioned coloring for his orchestration. Then Jackiw took the stage. From the first bars it was apparent that this was the music these Russians were born to play. Sounding as crisp and lush as a fresh pear, they embraced Tchaikovsky. Another orchestra might turn to sentimentality under the assault of grandeur, soloistic brilliance and gypsy melodies, but these musicians built loving phrases over a core of careful sorrow. Jackiw immersed himself in the emotional sweep of the Concerto, lingering over the longer notes that anchored each run with thick vibrato. And those runs were tossed off, an unself-conscious delight in absolute technical mastery. He blistered through the finale and after several curtain calls came back for an encore—the Largo movement from J. S. Bach’s Sonata in C major. As slow and sweet as the Concerto was sizzling, this mature 24-year-old gave us long double stop chords with sureness and hesitation in perfect balance. After trenchant contrasts the Moderato took the motif and treated it more gently, passing from clarinet to flute and bassoon. The manic Presto led to the grim Largo, a bitter reminder of war’s aftermath. It ends with a return to circus spectacle, shrill and derogatory, leaving us unsettled by the bitterness. Flutist Maxim Rubtsov, cellist Alexander Gottgelf and concertmaster Alexei Bruni had opportunities to shine in this ensemble of top talents. Pletnev conducted throughout with small gestures, drawing all eyes to his careful movements. After several callbacks he relented and played two encores, the two movements from his own Jazz Suite. Delightful shtick gave way to slinky blues in this Russian tribute to American idiom. This article was originally published in the Piedmont Post.